This page discusses how to choose the best TV resolution for your Xbox One console. Learn about TV resolutions and the resolutions that Xbox One X and Xbox One S support. Displays 480 active lines of information from the top to the bottom of the screen. Displays 854 lines of information from left to right. Provides a 4:3 standard definition (SD) viewing area. Note This resolution is supported on the Xbox One console but is not recommended. When you set your TV to 480p, you’ll see a widescreen image letterboxed into a 4:3 space. You'll see bars of empty space on the right and left side of the screen when a 4:3 aspect ratio picture is displayed on a 16:9 HDTV. This is because the images are designed to display widescreen at a 16:9 aspect ratio. The picture is squeezed down on the sides until it fits on a 4:3 screen and will show bars of empty space on the top and bottom. Displays images at a maximum of 1280 x 720 pixels. Provides a 16:9 high definition (HD) viewing area. 720p is the lowest resolution on most HDTVs. However, the picture is still excellent, and the quality of the images in 720p is nearly indistinguishable from higher resolution HDTV sets on a screen smaller than 37 inches. If your HDTV offers only 720p and 1080i, you should select 720p for the best resolution. Displays images at a maximum resolution of 1920 x 1080 pixels. The "i" in 1080i stands for interlaced scan. This means that half the lines that make up screen images are "redrawn" by your HDTV 60 times a second. This format looks great with most content, but there is a slight blur (called "motion-blur") with fast-moving video. 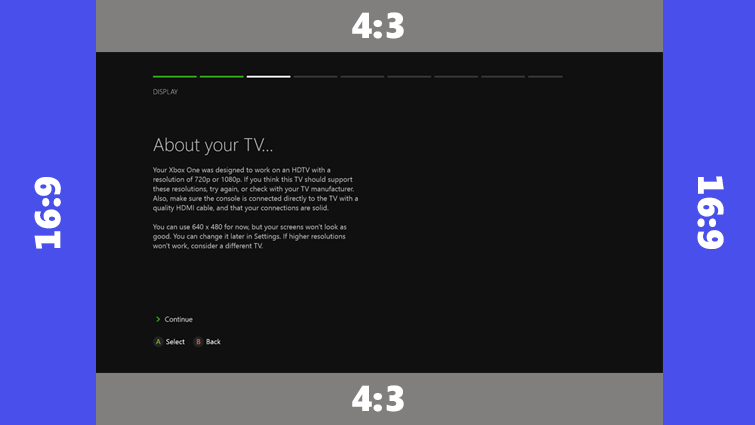 For this reason, Xbox One doesn't support interlaced resolutions. isplays images at a maximum of 1920 x 1080 pixels. Provides the user with a 16:9 high definition (HD) viewing area. 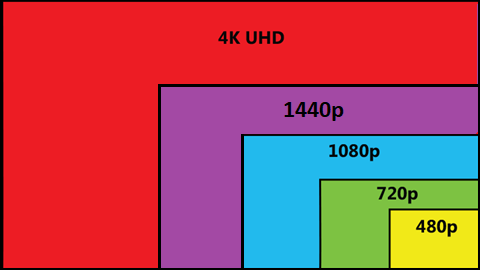 1080p is the most common resolution for movies, TV, gaming, and many of the experiences that Xbox One has to offer. A 1080p television makes no compromises in image quality, so you can enjoy content like Blu-ray movies at their intended resolution. Each line of pixels on the screen is redrawn 60 times a second or faster. This reduces motion-blur and creates a crisp picture. Note If you have an Xbox One S or an Xbox One X and your TV supports 120Hz over HDMI, selecting this resolution allows you to change the refresh rate to 120Hz. For more information, see How to adjust the display settings on your Xbox One console. Displays images at a maximum of 2560 x 1440 pixels. A growing number of computer monitors are sporting a 1440p resolution and becoming a popular choice among gamers. It’s sometimes referred to as “Quad HD,” because it offers four times the resolution of 720p HD display. You must have an Xbox One X or an Xbox One S and a monitor or TV that supports 1440p to use the 1440p resolution. If you have an Xbox One S or an Xbox One X and your TV supports 120Hz over HDMI, selecting this resolution allows you to change the refresh rate to 120Hz. For more information, see How to adjust the display settings on your Xbox One console. Displays images at a maximum of 3840 x 2160 pixels. Provides the user with a 16:9 ultra-high definition (UHD) viewing area. With four times the resolution of 1080p HD, 4K Ultra HD delivers the clearest, most realistic video possible. Play games on your Xbox One X natively at 4K UHD, or stream 4K content on Netflix, YouTube, Hulu, and Amazon Video, and watch Ultra HD Blu-ray movies in stunning visual fidelity with HDR (high dynamic range) on your Xbox One X or Xbox One S.
Note You must have an Xbox One X or an Xbox One S and a 4K TV to use the 4K UHD resolution. Would you like to contact Support regarding the "About TV resolutions and Xbox One" issue you were reading about or a different issue?